Whether you are looking for retirement in a warm place, or if you would like a home away from home, or an excellent rental investment, or if you want to buy a house in Mexico for any other reason- there is a choice that is right for you. A Mexico home could be a beachside villa worth millions of dollars, or it could be a townhouse, with a shared pool, at a considerably more affordable price. 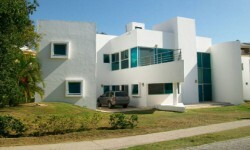 Row-type houses in more local communities of ocean-side cities can start as low as $35,000, and go up from there; so whatever your price range, whatever your dreams are, you wil ll find a home in Mexico that is right for you. Today we are highlighting a Beautifully Spacious 420 Sq.Mts Home built in 600 Sq.Mtr the lot alone is valued at $356,000 US. On the beach side of Playacar Fase II. Close to all the resorts and a quick 5 minute walk out your back yard and your on the beach. This house comes fully furnished of can be modified to your taste. $900,000 US REDUCED NOW ONLY $600,000 US OWNERS ARE MOTIVATED TO SELL! !